Welcome to our website! 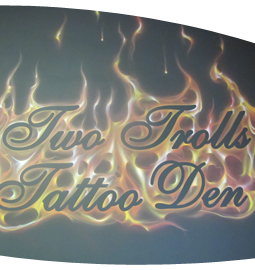 Located at #1 King Street E in the heart of Dundas Ontario, Two Trolls Tattoo Den has been serving the Hamilton area with body art and piercing services for many years. We have both male and female artists available and pride ourselves in cleanliness in a health inspected environment. For peace of mind we remove all needles and equipment from their packages in front of our clients. Our customers love and often comment on our friendly and welcoming atmosphere in which we strive to provide a one of a kind experience. We thoroughly enjoy bringing life to old faded tattoos or designing the custom work that you've always wanted! We carry a variety of high quality stainless steel, titanium, cubic zirconia and organic body jewelry. To reach us for additional information or to book a consultation please contact us at (289) 238-9861. Shop hours are Tuesday to Sunday 12:30- 7pm but we are often open later. We offer a discount of five dollars off any piercing to college and university students with proof of student ID.